The Bachelor study programme focuses on the rapidly changing global economic environment and the opportunities for entrepreneurial activity. By combining theory, practice and continuous assessment students will discover how to succeed, either as a professional decision-maker or as an entrepreneur in the business world. Students learn the entire process of starting a business including finding a profitable idea, gathering funding and resources, developing a plan, starting the business and managing the business thereafter. The course provides students with the means to identify socially economic process difficulties and the knowledge to create solutions through stimulating their analytical abilities and scientific research skills. The aquired knowledge creates a competitive advantage ensuring great job opportunities for graduates. Graduates are qualified to work as managers and economic specialists in state offices and institutions, banks and private businesses. Graduates will be able to start their own business or assume responsibility for product, process or service innovation in any size of enterprise. The Bachelor study programme Organization andManagement of International Economic Relations is designed to educate and train senior specialists and heads of departments in the field of international economic relations management in accordance with the global labour market demands. The key emphasis of the study process is placed on the development of professional and practical skills based on scientific achievements, theoretical knowledge and specifics of the particular industry. Recruiters in the financial world are starting to look for people qualified in the increasingly specialized areas of finance. The Master study programme will furnish students with the practical applied knowledge and additional values needed to succeed in this area. The course strives to educate future company financial managers and finance investment administration specialists in order to solve financial problems and make decisions in today’s ever-changing business environment. 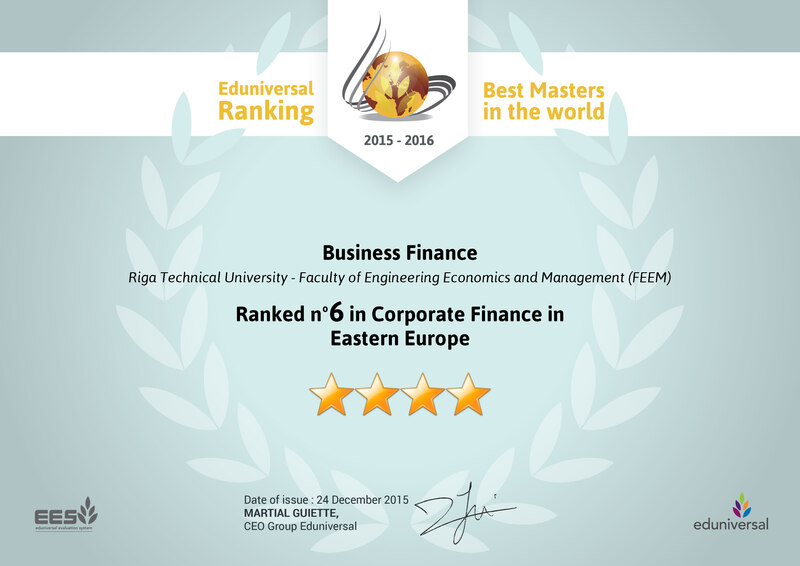 Two specialities – Finance Management and Finance Economics – are available for students studying in Business Finances. Gain a strong foundation in the principles and practice of finance and the latest practical tools and techniques to boost analytical skills and financial decision-making. Graduates of the study programme Business Finance have a variety of job opportunities in government, financial services, public accounting, or business advisory and private companies. They are able to continue their career as specialists in business finance management, research, work in finance resource management in different companies and finance investment management in the field of financial services. Moreover, a specialist in business finances can work for a public accounting or consulting company, a governmental agency or a business entity. The Master study programme is designed specifically to address the necessity for a graduate course that deepens student’s theoretical and practical knowledge of entrepreneurial and managerial processes. The programme is based on fundamentals of entrepreneurship activities – competitive product or service production and economically profitable distribution. The studies provide a strong theoretical and practical base and four specialised courses in Entrepreneurship Management, Entrepreneurship Economics, Project Management, and Financial Risk Management. The acquired knowledge creates a powerful competitive advantage to the graduates of the programme ensuring great job opportunities both in public and private sector. Postgraduates are highly qualified in the field of economics, entrepreneurship and management. The acquired knowledge provides the necessary expertise to analyse and evaluate economic processes in local, international and state institutions as well as the private sector. Graduates are able to carry out scientific research and pedagogical work. Students graduating from this programme will be able to pursue entrepreneurial opportunities in the industry of their choice after gaining relevant experience. Students with this degree are suited for careers in Business Administration/Management/Operations, Financial Management Services and Marketing in local or international, state and private sector institutions. 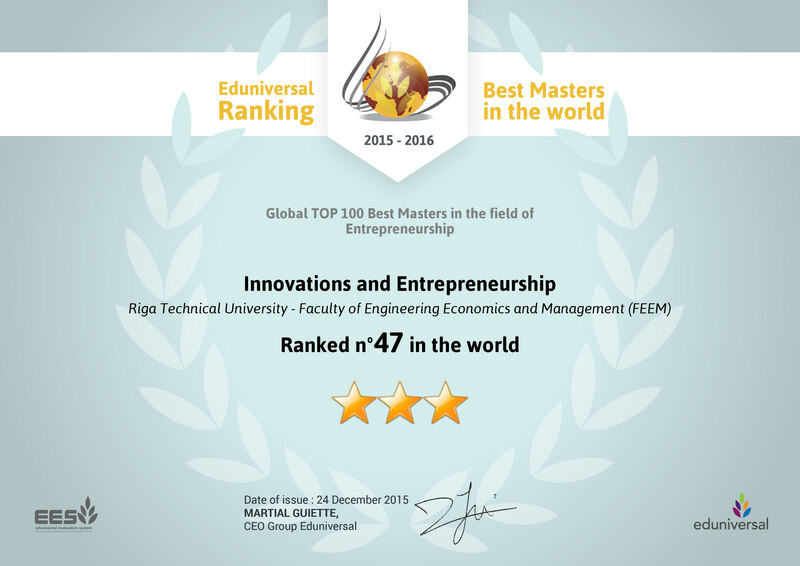 The joint Norwegian-Latvian International Master Program in Innovation and Entrepreneurship was launched in 2003 as a continuation of a 6-year successful cooperation between Riga Technical University (Latvia) and Buskerud University College (Norway). The program was developed taking into consideration the similar study program development in USA and experience of Norwegianpartners, which was adapted in compliance with the legislative requirements of EU. The Program offers relevant state of the art courses in business areas important for the general advancement of the enterprise, as well as specialized courses in innovation and new product and service development. During the study process students have to write and defend Master Thesis, as well as to settle Practical Placement/ Internship. International study trip (additional fee may apply). MBA degree holders may pursue their career as entrepreneurs or work as managers in the field of general business management, marketing, finance,international business, consulting and other fields. Additionally required: Working experience in a managerial position for at least 2 years. The study programme is designed to educate and train senior specialists, heads of departments in the field of international economic relations or logistics and transport economics in accordance with the global labour market demands. The key emphasis of the study process is placed on the development of professional and practical skill based on scientific achievements, theoretical knowledge and specifics of the particular industry. 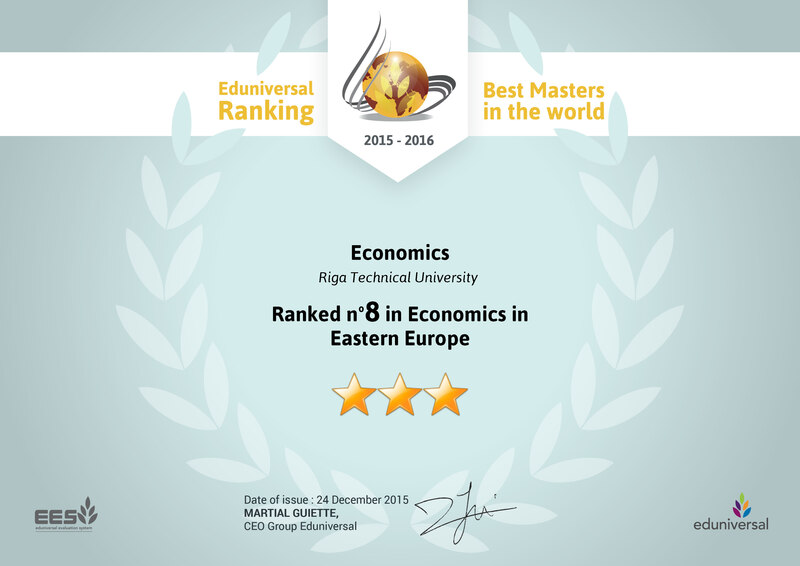 – business logistics and transport economics. Taking into consideration the specifics of the industry, some study courses are implemented in the English language in order to directly improve the use of professional terminology related to international business development and to promote successful cooperation with foreign institutions, organizations and companies. The graduates of the study programme with the specialization in international economic relations can build their careers in the sphere of international business, trade and international chains (corporate networks), as well as in various industrial, trade and service enterprises, by developing the international marketing strategy of export and trading divisions and departments, as well as by developing and searching for new market opportunities and cooperation partners all over the world. Graduates can also work at the institutions of the European Union, national and local government institutions and non-governmental organizations in Latvia and abroad. The managers and specialists of external and international relations departments perform creative and innovative planning and implementation of foreign and international relations strategy and tactics in accordance with their job objectives; analyse and evaluate international economic relations issues and plans; coordinate and supervise the work of the department; coordinate their activities with the manager of the enterprise, government or non-governmental institution, as well as collaborate with other department managers. The graduates of the study programme with the specialization in business logistics and transport economics work at companies engaged in logistics, international and domestic cargo or passenger transportation, wholesale trade, retail trade, manufacturing and services, as well as at state and local government institutions, whose activities are related to transport and/or logistics industry or which ensure logistics service management and organization. The manager of logistics department monitors the quality of logistics services; defines the company policy in logistics processes; executes general supervision of supplier performance, and a policy of cooperation with suppliers and buyers of goods and services; provides control and analysis of the level of logistics costs in the enterprise, optimization management; together with the administration, marketing, purchasing or sales professionals develops the strategy of the company’s inventory management; collaborates with other departments of the company; at the strategic level is responsible for establishment of goods and services distribution channels and supply chains, including the locations of warehouses and choice of transport modes and their combinations, cost optimization; manages and administers the logistics department staff; ensures and manages international sea, air, land or intermodal cargo transportation; provides passenger flow analysis and cost level management in passenger transportation; if necessary implements flow optimization; monitors passenger satisfaction level in collaboration with quality control specialists; sets the route planning methodology in accordance with passenger flows; ensures passenger service regularity and adequacy; provides and manages international sea, air, road or rail passenger services. Professional Master study programme „Urban and Regional Engineering Economics” trains high level specialists for work in the field of economics; to train socially responsible and highly qualified specialists, whose knowledge, skills and competencies will allow them to work at state institutions, local governments, private companies as well as conduct scientific research. Study programme educates specialists for scientific work and for further doctoral studies. Depending on the previous education students can pursue the degree for 1.5 or 2.5 years. The study programme envisages compulsory theoretical courses in the field of economics: microeconomic and macroeconomic analysis and economic analysis methods. The courses of limited choice are chosen according to the students’ direction of specialization: Regional Economy and Urban Economics. Professional master study programme provides knowledge, which forms a certain degree of intelligence and culture, in order to successfully carry out socially necessary work and cooperate with Latvian and foreign counterparts. * Click the Study program name to see more detailed information about the program (in PDF). Programs marked with Eduniversal logo have been rated by Eduniversal. Click the logo of the corresponding program for more details. Academic higher education programmes are based upon fundamental and/or applied science; they usually comprise a thesis at the end of each stage and lead to a Bachelor’s degree (Bakalaurs) and Master’s degree (Maģistrs). Duration of Bachelor’s programmes may be 3 or 4 years at different institutions. The 3-4-year Bachelor’s degree is considered as a complete academic qualification. Master’s degree is awarded after the second stage of academic education and requires at least 5 years of university studies. The Law on Higher Education Institutions and the Law on Vocational Education and Training stipulate a two level professional higher education – the first level of professional higher education (ICSED level 4 and 5) or college education (2-3 years) leading to professional qualification Level 4 (diploms par pirmā līmeņa profesionālo augstāko izglītību), and second level of professional higher education leading to qualification Level 5 (2-3 years). Having mastered a programme of professional higher education, students are awarded a professional qualification or a professional Bachelor’s degree that can be followed by a further 1-2 years of professional Master’s studies. The Master’s degree (Magistrs) of higher professional education is awarded if the total duration of studies is at least five years. There can be the so-called “short” second level professional higher education study programmes (1-2 years), where qualification is obtained on the basis of the previously acquired first level professional higher education or academic Bachelor’s degree. 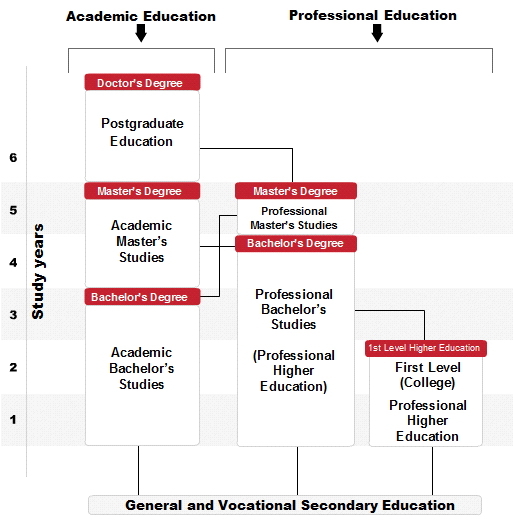 In total the duration of professional qualification Level 5 study programmes is not less than 4 years after secondary education and not less than 2 years after college education. Master’s degree or the equivalent (graduates of 5-6 year professional higher education programmes in Law and Medicine can continue education at postgraduate level directly) is required for admission to doctoral studies (Ph.D.). Doctoral studies last 3-4 full-time years. They include advanced studies of the subject in a relevant study programme (or an equivalent amount of independent research while working at a university, research institution, etc.) and a scientific research towards doctoral thesis. Publications in internationally quoted scientific journals are required before public defence of the doctoral thesis as an integral part of a study programme. The Council of Science appoints Promotion Council and sets the procedures for award of Doctor’s degrees.